Cavities are also known as dental caries and they are an early stage of tooth decay. Cavities are incredibly common, so it is likely that if you are reading this that you have experienced a cavity at least once in your life. Some people are more prone to them than others, but for the most part, cavities can be prevented. In order to prevent tooth decay, you need to keep harmful bacteria from attacking your teeth. You can do so by keeping up with a good oral hygiene routine, visiting your dentist at least once every six months, and being mindful about what you eat and drink. If you do encounter a cavity, it is important for you to get it treated as soon as you can. Dr. Young in Lafayette, LA can help you deal with cavities or other conditions with your smile. A cavity is formed when the enamel of the tooth has eroded enough to cause a hole. Once the enamel is broken through, the bacteria attacking the tooth will make much quicker progress. If a cavity is left untreated, it is only a matter of time before the tooth decay impacts the vulnerable inner tissues of the tooth. At this more severe stage, a root canal treatment or even extraction may become necessary to repair your smile’s health. Dealing with a cavity is important because it will not get better on its own. If you fall down and mildly skin your knee, you know that (in most cases) the skin will repair itself pretty easily. Your body does a good job of repairing itself. However, when it comes to your teeth – enamel will not grow back. If you have damaged enamel from a cavity, it will stay damaged until treated. 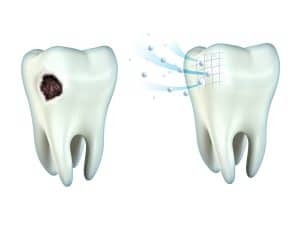 A dental filling can disinfect the tooth to stop the decay and restore the enamel using a tooth-colored bonding material. If you are vigilant about your dental visits, your oral hygiene, and your nutrition, it may come as a shock to you to learn you have a cavity. You should know that some people may be more prone to decay due to the pH balance of their mouth, if they grind their teeth, have acid reflux, etc. Talk to your dentist about what may contribute to your tooth decay. Do you think you may have a cavity?